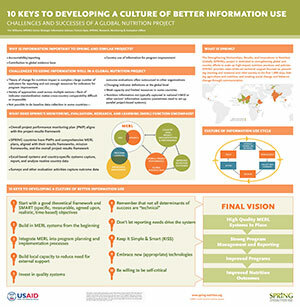 This poster was prested by Francis Opio at the Consortium of Universities for Global Health (CUGH) Conference in Washington, DC on April 8, 2017. The Strengthening Partnerships, Results, and Innovations in Nutrition Globally (SPRING) project is dedicated to strengthening global and country efforts to scale up high-impact nutrition practices and policies. SPRING provides state-of-the-art technical support focused on preventing stunting and maternal and child anemia in the first 1,000 days, linking agriculture and nutrition, and creating social change and behavior change through communication. Why is Information Important to SPRING and Similar Projects? What Does SPRING's Monitoring, Evaluation, Research, and Learning (MERL) Function Encompass?